Huge crops! Found by chance on the Malvern Hills in 1985 fruit are on the small side but are packed with intense flavour. APRICOTS, PEACHES & NECTARINES - The advent of new rootstocks and modern varieties means that these lovely fruits can now be very successfully cultivated in the garden. The best method is to fan train them against a warm south or southwest facing wall. Here the tree receives the warmth of the sun throughout the day and then benefits from the heat that has been absorbed by the bricks through the time when in shade or darkness. Thus the fruits will ripen with little check become large and sweet (note that if a suitable wall is not available a warm fence or trellis in a sheltered sunny part of the garden is a very good second choice). Before planting erect a trellis against the wall. The lattice should be 1' square and the trellis should measure approximately 2.1m (7') long x 1.8m (6') high. A fan of 2.4m (10 x 8') canes should be attached to this which will act as a support and guide for the tree. Plant the tree against the trellis at the base of the fan. Shortly after the tree produces its first leaves, cut back the central leader to about 45cm (18") above ground level. As the side branches develop they can be trained along the canes, attaching them with soft string. (Note that wire ties should not be used as they will damage the tree.) Peaches and nectarines can also be grown in the open as a bush in milder southern counties and modern apricots are being successfully grown in this way south of a line from the Wash across to North Wales. After the first year the branches should be pruned back by up to one half to encourage feathering. By this time enough branches should be present to have enough for each cane and the final fan shape will be starting to develop. Fruit bud will be borne on the small sub branches along each main branch of the fan. 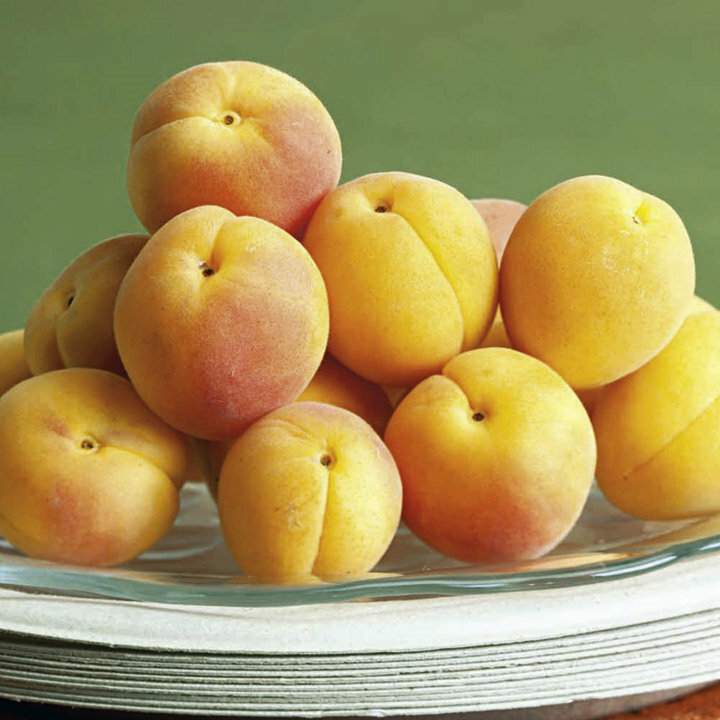 Flowering of peaches, nectarines and apricots occurs early in the spring, often as early as late February. Whilst the blossom is quite resistant to frost damage it is worthwhile draping the tree with a protective cover such as horticultural fleece overnight if frost is expected. At this time of year very few pollinating insects are active and giving the tree a little help by hand pollinating will ensure a good crop is set. A very soft artists brush or even a ladies make up brush is ideal for the purpose, this should be gently introduced into flowers in turn thus transferring pollen. Choose a sunny day for this job if possible. Peaches and Nectarines should always be pruned in early spring at early leaf stage to reduce the risk of spreading bacterial canker and silver leaf infection. Peach leaf curl is likely to be a problem with peaches and nectarines although happily apricots do not suffer. The responsible fungus is carried in raindrops which infect the dormant bud cases in winter. Prevention can be effected in two ways. Firstly, raindrops should be prevented from hitting the tree. This can be effected by building a curtain of polythene sheet which can be lowered over the tree. The added benefit of this is that it will protect the blossoms against frost. Additionally an application of Bordeaux mixture (or other copper based funigicide) is advisable at leaf fall and again in early February.